After a rather disastrous live action movie (which they had nothing to do with! 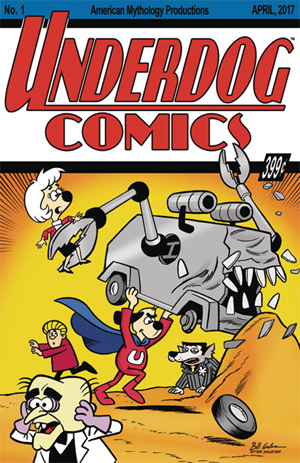 ), American Mythology Comics have decided that Underdog deserves a new coat of paint — and a new comic book series all his own. Created in 1964 by W. Watts Biggers for Total Television, the original Underdog animated series told the story of an anthro dog (known only as “Shoeshine Boy”) who had the secret ability to transform into the flying caped crime-fighter known as Underdog. Now, many years later, American Mythology present the new full-color comic written by Batton Lash and illustrated by Bill Galvan. It’s hitting the shelves this month, and Previews World has an interview with the creators.